This Lynx concept art shows a couple human figures for scale reference. This story was updated at 3:18 p.m. EDT. A private rocket-building company that is designing a suborbital space plane for future paid trips to the edge of space will open a new test facility in Texas, company officials announced today (July 9). The Mojave, Calif.-based XCOR Aerospace and the Midland Development Corporation unveiled plans today for XCOR's new Commercial Space Research and Development Center Headquarters in Midland, Texas. The research facility will be used to test XCOR's Lynx space plane, a reusable, winged spaceship that is designed to carry two passengers and science experiments to the edge of space. The company also plans to eventually develop and test components for an orbital version of the Lynx vehicle in Midland, company officials said. "We are pleased to be establishing our R&D Center in Midland, Texas, where the weather, surrounding landscape, the airport, and the local & state government environment are ideally situated for the future growth and the ultimate realization of a fully reusable orbital system," Andrew Nelson, chief operating officer of XCOR Aerospace, said in a statement. "With future suborbital operational sites on the East and West Coasts of the United States and around the world, plus a manufacturing and test facility geographically separate from our R&D facility, Midland will truly be at the heart of XCOR’s innovation engine." Local government officials applauded XCOR's decision to establish an aerospace foothold in the state. The new R&D headquarters will be established in a newly renovated 60,000-square-foot hangar at the Midland International Airport (MAF). Construction of the office space and test facility will begin early next year, company officials said, and is expected to be complete by late autumn in 2013. "XCOR will be upgrading an existing hangar at Midland International Airport," Marv Esterly, director of airports at MAF, said in a statement. "This new R&D facility has the potential to open the door to even more economic development at our airport and for our community." The city of Midland is also applying to the Federal Aviation Administration for Midland International Airport to be certified as a commercial space launch site, representatives from the Midland Development Corporation said. The application process will likely last 12 to 18 months, but once licenses have been approved, and the airport hangar is fully renovated, XCOR is expected to boost its activities in Texas. XCOR recently announced it is aiming to begin operational Lynx flights from California's Mojave Spaceport in 2013, and flights from the tiny Caribbean island of Curacao the following year. 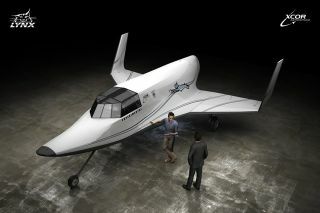 XCOR is not the only private rocket company that has expressed interest in building new facilities in Texas. California-based SpaceX, the private aerospace firm that successfully launched the first commercially built, unmanned spacecraft to the International Space Station, has proposed building a launch facility in Cameron County in southern Texas for orbital and suborbital vehicles.